will be FREE after your Cash Back offer from TopCashBack.com ! FREE fits my budget nicely! Register. It is Free! Go HERE to register. Confirm your registration via the email they will send you. Shop the Walmart link on the topcashback site. Pick Up In Store means No Shipping Charge! My cash back will actually mean they paid me to make the purchase! There is an overage of $1 !! You simply cannot beat that! After you register on the TopCashBack.com site, you will be able to select if you prefer to receive your cash back via your PayPal account, direct deposited into your bank account or via an Amazon.com e-gift code! 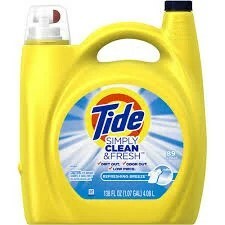 I’m looking forward to another opportunity to get paid to shop and I’m on my way to pick up my free Tide! We added a deck onto our home about 2 years ago. My husband placed the order for all of the lumber online via Ebates so we could get the cash back from Lowes. Shop online and pick up in store! Enjoy getting paid to shop! Register for free on Ebates.com HERE. Keep your eye out for those Exclusive offers with big rewards !